The hormonal form of vitamin D3, 1,25-dihydroxyvitamin D3 (1,25(OH)2D3), is an immune system modulator and induces expression of the TLR coreceptor CD14. 1,25(OH)2D3 signals through the vitamin D receptor, a ligand-stimulated transcription factor that recognizes specific DNA sequences called vitamin D response elements. In this study, we show that 1,25(OH)2D3 is a direct regulator of antimicrobial innate immune responses. The promoters of the human cathelicidin antimicrobial peptide (camp) and defensin β2 (defB2) genes contain consensus vitamin D response elements that mediate 1,25(OH)2D3-dependent gene expression. 1,25(OH)2D3 induces antimicrobial peptide gene expression in isolated human keratinocytes, monocytes and neutrophils, and human cell lines, and 1,25(OH)2D3 along with LPS synergistically induce camp expression in neutrophils. Moreover, 1,25(OH)2D3 induces corresponding increases in antimicrobial proteins and secretion of antimicrobial activity against pathogens including Pseudomonas aeruginosa. 1,25(OH)2D3 thus directly regulates antimicrobial peptide gene expression, revealing the potential of its analogues in treatment of opportunistic infections. The innate immune system provides front-line protection against infectious agents (1). Recognition of bacterial LPS by TLR (1) induces expression of antimicrobial peptides (2, 3) that can fend off bacterial and viral infections (2, 3, 4, 5) and accelerate wound healing (6). Antimicrobial peptides have generated intense interest because of their therapeutic potential against antibiotic-resistant pathogens such as Pseudomonas aeruginosa, the agent responsible for long-term infection and death in many cystic fibrosis patients (7). We are interested in the molecular events underlying signaling by the hormonal form of vitamin D3, 1,25-dihydroxyvitamin D3 (1,25(OH)2D3).3 Vitamin D3 is obtained from limited dietary sources and through the action of UV B light (UVB) on 7-dehydrocholesterol in skin (8). It is a product of the skin’s homeostatic system, which acts as a protective barrier and environmental sensor (9). Although initially identified for its role in calcium homeostasis, 1,25(OH)2D3 is also an immune system modulator (8, 9) and induces expression of the TLR coreceptor CD14 (10, 11). 1,25(OH)2D3 signals through the vitamin D receptor (VDR), a member of the nuclear receptor superfamily of transcription factors (8, 12) that is widely expressed in epithelial tissues and cells of the immune system (8). Ligand binding induces VDR heterodimerization with related retinoid X receptors and DNA binding to cognate vitamin D response elements (VDREs) composed of direct repeats of consensus PuG(G/T)TCA motifs (8). In this study, we show that 1,25(OH)2D3 directly induces antimicrobial gene expression and activity through consensus VDREs located in the promoters of the cathelicidin antimicrobial peptide (camp) and defensin β2 (defB2) genes, pointing to important new therapeutic uses of vitamin D3 analogues in treatment of opportunistic infections. camp promoter sequences between −532 or −491 and +124 were cloned by PCR amplification of genomic DNA with primers 5′-agctaactgcaacttctgctt-3′ and 5′-gtgattctcatgcctcagct-3′, respectively, and 3′ primer 5′-cagacatggggaccatgaag-3′. defB2 promoter sequences downstream from −1266 or −1225 were amplified with primers 5′-cagggttcttcagaacctga-3′ and 5′-cagggttcttcagaacctga-3′, respectively, and common 3′ primer (+23) 5′-agactcagctcctggtgaagctc-3′. Fragments were cloned directly into PCR2.1 (Invitrogen, Burlington, Ontario, Canada), then digested with BglII and KpnI and subcloned into luciferase reporter plasmid pXP2 to make camp-p/pXP2, camp-p(-V)/pXP2, defB-p/pXP2 and defB-p(-V)/pXP2. All lines were cultured under recommended conditions. SCC25, Calu-3, and U937 were obtained from American Type Culture Collection (Manassas, VA) and human adult and neonatal primary keratinocytes from BioWhittaker (Walkersville, MD). Human monocytes and neutrophils were isolated and cultured as described previously (13, 14). COS-7 cells grown in 6-cm wells in DMEM, supplemented with 10% FBS, were transfected in medium without serum with Lipofectamine 2000 (Invitrogen) with 100 ng of nuclear receptor expression vector pSG5/VDR, 300 ng of camp-p/pXP2, or camp-p(-V)/pXP2, or defB-p/pXP2 or defB-p(-V)/pXP2, and 100 ng of internal control vector pCMV-β-gal. Medium was replaced 6 h after transfection by DMEM, supplemented with 10% FBS. After 24 h, medium was replaced by a medium containing charcoal-stripped serum and ligand (100 nM) for 24 h. Cells were harvested in 200 μl of luciferase reporter lysis buffer (Promega, Madison, WI). Transcripts were amplified after reverse transcription with Superscript II (Invitrogen) using 5′ and 3′ primers, respectively: 5′-atgaagacccaaaggaatgg-3′ and 5′-gggtacaagattccgcaaaa-3′ for camp; 5′-GCTCCTGGTGAAGCTCCCAGCC-3′ and 5′-TGCGTATCTTTGGACACC-3′ for defB2; 5′-atgcccctaggtctcctgtg-3′ and 5′-agccgtcgatacactggtcg-3′ for neutrophil gelatinase-associated lipocalin (ngal); and 5′-ggtgaaggtcggtgtcaacg-3′and 5′-caaagttgtcattgatgacc-3′ for gapdh. Immunocytochemistry was performed using rabbit anti-LL37 (human) serum (1/400) against CAMP (Phoenix Pharmaceuticals, Belmont, CA) or rabbit anti-HBD-2 antiserum (1/500; Alpha Diagnostic International, San Antonio, TX) and goat anti-rabbit-FITC (1/200) secondary Ab (Sigma-Aldrich, St. Louis, MO) (15). Assays were performed with double-stranded oligonucleotides containing VDREs from the camp (5′-gatcctcccgggttcaatgggttcaagtgaa-3′), defB2 (5′-gatcctgaagaggtcaggcaggtcatgagga-3′), or mouse osteopontin (mop) promoters (5′-gatccgtacaaggttcacgaggttcacgtctta-3′) along with a mutant defB2 VDRE sequence (5′-gatcctgaagagaatggcagaatgtgagga-3′). ChIP assays (16) were performed with SCC25 cell lysates immunoprecipitated with either normal rabbit IgG or anti-VDR (C-20) rabbit polyclonal Ab (Santa Cruz Biotechnology, Santa Cruz, CA). PCR were performed with primers: camp VDRE region (−535/−286), 5′-ctcagctaactgcaacttctgctt-3′ and 5′-atctccagctctaggcattg-3′; camp outside the VDRE (−1484/−1743), 5′-tatctctcctggctgtgatc-3′ and 5′-ccatcacataggctcatctg-3′; defB2 VDRE region (−1266/-1051), 5′-cagggtttcttcagaacctga-3′ and 5′-tgaggtctctggtgtctctc-3′; and defB2 outside the VDRE (−3549/−3259), 5′-ttctcacaacctttgttgggtc-3′ and 5′-ctgctgttgaagaagggcattgt-3′. Escherichia coli and P. aeruginosa were grown to early log phase at 37°C in Luria (L) broth. Assays were performed in two ways, with similar results. Cultures (50-μl aliquots) were diluted to 5000 CFU/well in 96-well plates. One hundred fifty microliters of tissue culture medium was added and samples were incubated at 37°C with shaking. A600 were measured after 3 h of incubation. Alternatively, 50-μl cultures in L broth were diluted to 500 CFU with 150 μl of regular medium or conditioned medium. Samples were incubated at 37°C with shaking for 2 h, bacteria were plated onto L broth plates, and CFU were counted after 18 h.
We have found in a screen of the human genome for VDREs (manuscript in preparation) that the promoters of the camp (also known as LL37, CAP18, or FALL39) and defB2 genes contain consensus VDREs 507 and 1231bp upstream of their respective transcription initiation sites (Fig. 1⇓a), strongly suggesting that 1,25(OH)2D3 directly regulates their expression. VDRE function was tested with reporter genes driven by cloned camp and defB2 promoters. Sequences containing VDREs mediated 1,25(OH)2D3-dependent expression, whereas deletion of the elements abolished induction by 1,25(OH)2D3 (Fig. 1⇓b). 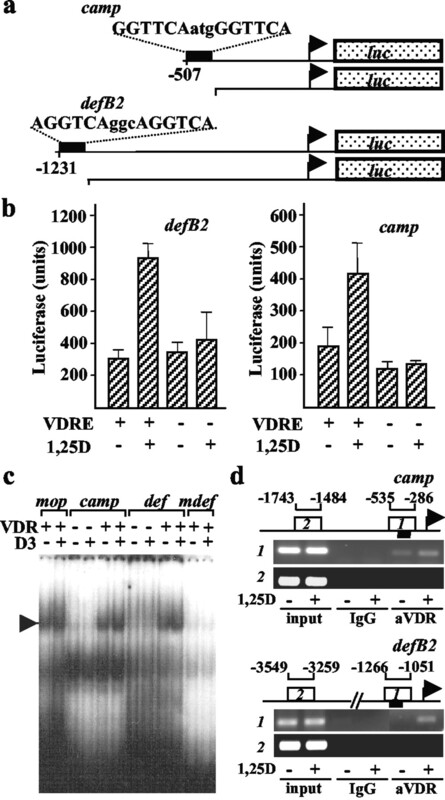 Partially ligand-dependent VDR-DNA complexes formed on camp or defB2 VDREs (Fig. 1⇓c) were dependent on expression of the VDR and occurred at levels similar to those observed on the consensus mop gene element. Binding in vivo in SCC25 cells of the VDR to the defB2 and camp promoters was tested by ChIP assay (Fig. 1⇓d), which revealed 1,25(OH)2D3-dependent interaction with VDRE-containing promoter sequences (regions 1), but not adjacent sequences (regions 2) or with the gapdh promoter (data not shown). Together, these data show that the camp and defB2 promoters contain functional consensus VDREs. The camp and defB2 promoters contain VDREs. a, camp and defb2 promoters cloned into expression vector pXP2. b, 1,25(OH)2D3 (1,25D)-dependent luciferase expression in transiently transfected COS-7 cells is dependent on the presence of VDREs. Normalized activities are the means ±SEM from at least three experiments. c, EMSAs with extracts of COS-7 cells transfected with a VDR expression vector or empty vector and oligonucleotides containing VDREs from the camp, defB2, or mop promoters, along with a mutant defB2 VDRE sequence. d, ChIP assays of interaction of the VDR with the camp and defB2 promoters in vivo, performed with control IgG or anti-VDR (αVDR) Abs. PCR amplifications were performed on regions of promoters containing VDREs (black bars, 1) and adjacent control regions (2). Expression of the defB2 and camp genes was tested in several 1,25(OH)2D3-sensitive human cells, including adult human keratinocytes primary cultures, neutrophils and monocytes, SCC25 head and neck squamous carcinoma cells (11), a well-differentiated line derived from a floor of the mouth tumor, Calu-3 lung adenocarcinoma cells, which express several markers of upper airway serous cells (17), and U937 myelomonocytic cells (18) (Fig. 2⇓, a and b), as well as neonatal primary human keratinocytes (data not shown). 1,25(OH)2D3 treatment led to rapid and robust induction of camp mRNA in all cells tested (Fig. 2⇓a and data not shown). Expression of defB2 was enhanced by 1,25(OH)2D3 after 24 h in SCC25 and Calu-3 cells and primary cultures of adult keratinocytes (Fig. 2⇓b), although the fold induction was substantially lower than that of camp. No significant expression of defB2 was seen in other cells tested (data not shown), consistent with its epithelial expression pattern (2, 3). IL-1 is a robust inducer of defB2 (19) and stimulated its expression more rapidly (within 8 h) and strongly than 1,25(OH)2D3 (Fig. 2⇓c and data not shown). However, 1 nM 1,25(OH)2D3 enhanced the effect of IL-1 on defB2 over an 8-h period (Fig. 2⇓c and data not shown). 1,25(OH)2D3-regulated expression of camp (a) and defB2 (b) transcripts in human cell lines and primary cultures. c, 1,25(OH)2D3 (10−9 M) enhances the stimulatory effect of 8-h incubation with IL-1 (50 ng/ml) on defB2 expression in SCC25 cells. Results were monitored by RT-PCR and are presented as the means ±SEM from at least three experiments. 1,25(OH)2D3 treatment of SCC25 cells increased both defB2 and CAMP protein levels as revealed by immunocytochemistry (Fig. 3⇓, a and b) and Western blotting (data not shown). More importantly, medium from 1,25(OH)2D3-treated cells acquire antibacterial activity indicative of enhanced secretion of functional antimicrobial peptides. SCC25 or Calu-3 cells grown in petri dishes were treated with 1,25(OH)2D3 over 48 h, which led to a time-dependent accumulation in conditioned medium of activity against both E. coli and P. aeruginosa (Fig. 3⇓, c–f), the pathogen responsible for long-term infections in patients with cystic fibrosis (CF) (7). Note that 1,25(OH)2D3 on its own had no antibacterial activity (data not shown). 1,25(OH)2D3 (1,25D) induces antimicrobial peptide protein expression and activity. a and b, Immunocytochemistry was performed using rabbit anti-LL37 (human) serum against CAMP or rabbit anti-HBD-2 antiserum and goat anti-rabbit-FITC secondary Ab. c and d, Release of antimicrobial activity against E. coli from 1,25(OH)2D3-treated SCC25 cells (c) or Calu-3 cells (d). e and f, 1,25(OH)2D3 treatment of SCC25 (e) or Calu-3 (f) cells induces antimicrobial activity against P. aeruginosa (means ± SEM from at least three experiments). Signaling by LPS through TLRs induces expression of antimicrobial peptide genes, including camp (1). We tested the combined effects of short-term (4-h) incubation with LPS and 1,25(OH)2D3 on camp expression in human neutrophils, which revealed a striking synergistic stimulation of expression in the presence of limiting concentrations of the two inducers (Fig. 4⇓a) without affecting expression of gapdh. In addition, antimicrobial activity was induced in neutrophils treated (4 h) with 1,25(OH)2D3 and LPS individually or in combination (Fig. 4⇓b), although the induction was not blocked by cycloheximide under these conditions and was therefore not due to de novo gene expression. These results indicate that 1,25(OH)2D3 alone or in conjunction with LPS can induce camp expression and release of antimicrobial activity in neutrophils. Recent microarray studies have shown that LPS can induce multiple and robust changes in gene expression in isolated neutrophils, suggesting that de novo gene expression may contribute to innate immune responses, particularly given data showing that neutrophils are stabilized at sites of infection (20). Finally, we note that the effects of 1,25(OH)2D3 on antimicrobial peptide gene expression are not limited to camp and defB2, as we have also found that 1,25(OH)2D3 stimulated expression of ngal (Fig. 4⇓c), which has been shown to have antimicrobial activity (21), although the ngal promoter contains no obvious VDREs. Taken together, our data show that 1,25(OH)2D3 has multiple effects on the expression and release of antimicrobial peptides. Induction of camp expression by 1,25(OH)2D3 (1,25D) and LPS in human neutrophils. a, Analysis of expression of camp and gapdh by RT-PCR. 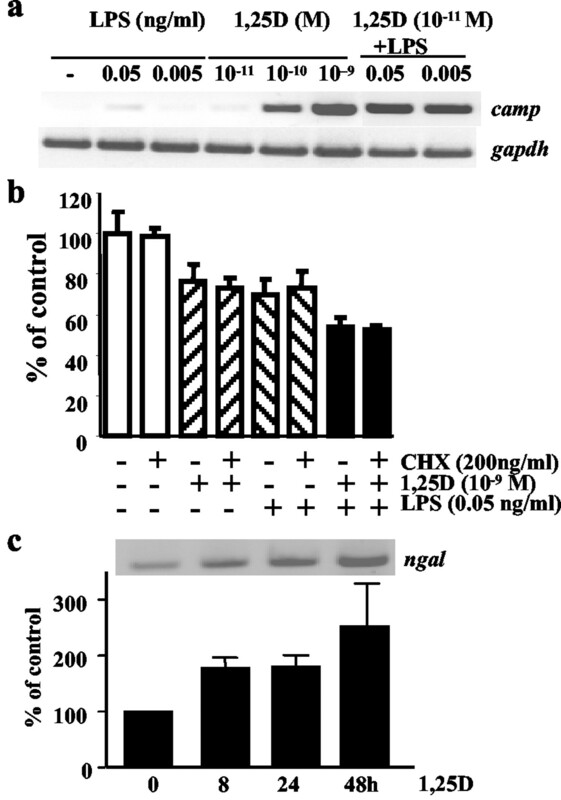 b, Induction of antimicrobial activity against E. coli by individual or combined 4-h treatments of human neutrophils with 1,25(OH)2D3 and LPS in the absence or presence of the protein synthesis inhibitor cycloheximide (CHX). c, RT-PCR analysis reveals that 1,25(OH)2D3 treatment of Calu-3 cells induces expression of ngal. The induction of antimicrobial peptide expression by 1,25(OH)2D3 may represent part of a feedback loop to the suppressive effects of UVB on innate immunity and reveals the potential of its analogues in treatment of opportunistic infections. The calcemic activity of 1,25(OH)2D3 has limited its use in treatment of conditions not related to mineral ion homeostasis. However, numerous analogues combine more potent therapeutic activity with weaker calcium mobilization (22). Enhancement of camp expression would be of considerable utility, as CAMP restored antimicrobial activity against antibiotic-resistant pathogens in sputum of CF patients (23) and enhanced responses against antibiotic-resistant pathogens in models of CF (24). Moreover, CAMP is a potent antisepsis agent; it blocked macrophage induction and enhanced survival of mice treated with lethal doses of LPS (23, 25). The robust induction of camp observed above suggests that 1,25(OH)2D3 analogues may be protective against sepsis. CAMP multifunctionality is further underlined by its acceleration of epithelial wound healing (6), suggesting that enhanced antimicrobial peptide expression would protect against infection after surgery and accelerate healing. ↵1 This work was supported by funds from Genome Canada (to J.H.W. and S.M.) and a grant from the Canadian Institutes of Health Research (to J.H.W.). V.B. and R.L. are holders of postdoctoral and postgraduate fellowships from the Canadian Institutes of Health Research, respectively, and J.H.W. and S.M. are chercheurs boursier of the Fonds de la Recherche en Santé du Québec. ↵3 Abbreviations used in this paper: 1,25(OH)2D3, 1,25-dihydroxyvitamin D3; camp, cathelicidin antimicrobial peptide; CF, cystic fibrosis; ChIP, chromatin immunoprecipitation; defB2, defensin β2; mop, mouse osteopontin; ngal, neutrophil gelatinase-associated lipocalin; VDR, vitamin D receptor; VDRE, vitamin D response element. Medzhtov, R.. 2001. Toll-like receptors and innate immunity. Nat. Rev. Immunol. 1:135. Zhang, L. Q., W. Yu, T. Tian He, J. Yu, R. E. Caffrey, E. A. Dalmasso, S. Y. Fu, T. Pham, J. F. Mei, J. J. Ho, et al 2002. Contribution of human α-defensin 1, 2, and 3 to the anti-HIV-1 activity of CD8 antiviral factor. Science 298:995. Heilborn, J. D., M. F. Nilsson, G. Kratz, G. Weber, O. Sorensen, N. Borregaard, M. Stahle-Backdahl. 2003. The cathelicidin anti-microbial peptide LL-37 is involved in re-epithelialization of human skin wounds and is lacking in chronic ulcer epithelium. J. Invest. Dermatol. 120:379. Pier, G. B.. 2000. Role of cystic fibrosis transmembrane conductance regulator in innate immunity to Pseudomonas aeruginosa infections. Proc. Nat. Acad. Sci. USA 97:8822. Lin, R., J. H. White. 2004. The pleiotropic actions of vitamin D. BioEssays 26:21. Slominski, A., J. Wortsman. 2000. Neuroendocrinology of the skin. Endocr. Rev. 21:457. Kelsey, S. M., M. L. J. Makin, M. G. Macey, A. C. Newland. 1990. γ-Interferon augments functional and phenotypic characteristics of vitamin D3-induced monocytoid differentiation in the U937 human leukemic cell line. Leuk. Res. 14:1027. Lin, R., Y. Nagai, R. Sladek, Y. Bastien, J. Ho, K. Petrecca, G. Sotiropoulou, E. P. Diamandis, T. Hudson, J. H. White. 2002. Expression profiling in squamous carcinoma cells reveals pleiotropic effects of vitamin D3 analog EB1089 signaling on cell proliferation, differentiation and immune system regulation. Mol. Endocrinol. 16:1243. Chawla, A., J. Repa, R. M. Evans, D. J. Mangelsdorf. Nuclear receptors and lipid physiology: Opening the X-files. Science 294:1866. Gesser, B., H. Leffers, T. Jinquan, C. Vestergaard, N. Kirstein, S. Sindet-Pedersen, S. L. Jensen, K. Thestrup-Pedersen, C. G. Larsen. 1997. Identification of functional domains on human interleukin 10. Proc. Nat. Acad. Sci. USA 94:14620. Bignold, L. P., A. Ferrante. 1987. Mechanism of separation of polymorphonuclear leukocytes from whole blood by the one-step Hypaque-Ficoll method. J. Immunol. Methods 96:29. Fernandes, I., Y. Bastien, T. Wai, K. Nygard, R. Lin, O. Cormier, H. S. Lee, F. Eng, N. R. Bertos, N. Pelletier, et al 2003. Ligand-dependent corepressor LCoR functions by histone deacetylase-dependent and -independent mechanisms. Mol. Cell 11:139. Luo, R.X., A. A. Postigo, D. C. Dean. 1998. Rb interacts with histone deacetylase to repress transcription. Cell 92:463. Finkbeiner, W. E., S. D. Carrier, C. E. Teresi. 1993. Reverse transcription-polymerase chain reaction (RT-PCR) phenotypic analysis of cell cultures of human tracheal epithelium, tracheobronchial glands, and lung carcinomas. Am. J. Respir. Cell Mol. Biol. 9:547. Liu, M., M.-H. Lee, M. Cohen, M. Bommakanti, L. P. Freedman. 1996. Transcriptional activation of the Cdk inhibitor p21 by vitamin D3 leads to the induced differentiation of the myelomonocytic cell line U937. Genes Dev. 10:142. O’Neil, D. A., E. M. Porter, D. Elewaut, G. M. Anderson, L. Eckmann, T. Ganz, M. F. Kagnoff. 1999. Expression and regulation of the human β-defensins hBD-1 and hBD-2 in intestinal epithelium. J. Immunol. 163:6718. Fessler, M. B., K. C. Malcolm, M. W. Duncan, G. S. Worthen. 2002. A genomic and proteomic analysis of activation of the human neutrophils by lipopolysaccharide and its mediation by p38 mitogen-activated protein kinase. J. Biol. Chem. 277:31291. Goetz, D. H., M. A. Holmes, N. Borregaard, M. E. Bluhm, K. N. Raymond, R. K. Strong. 2002. The neutrophil lipocalin NGAL is a bacteriostatic agent that interferes with siderophore-mediated iron acquisition. Mol. Cell 10:1033. Nagpal, S., J. Lu, M. F. Boehm. 2001. Vitamin D analogs: mechanism of action and therapeutic applications. Curr. Med. Chem. 8:1679. Saiman, L., S. Tabibi, T. D. Starner, P. San Gabriel, P. L. Winokur, H. P. Jia, P. B. McCray, B. F. Tack. 2001. Cathelicidin peptides inhibit multiply antibiotic-resistant pathogens from patients with cystic fibrosis. Antimicrob. Agents Chemother. 45:2838. Bals, R., D. J. Weiner, R. L. Meegalla, J. M. Wilson. 1999. Transfer of a cathelicidin peptide antibiotic gene restores bacterial killing in a cystic fibrosis xenograft model. J. Clin. Invest. 103:1113. Scott, M.G., D. J. Davidson, M. R. Gold, D. Bowdish, R. E. W. Hancock. 2002. The human antimicrobial peptide LL-37 is a multifunctional modulator of innate immune responses. J. Immunol. 169:3883.